M.I. Hummel is the legacy of Berta Hummel, a Bavarian artist. Born in 1909, Berta loved to draw everyday settings and her subjects were mostly children. A graduate of the Academy of Applied Arts in Munich, Berta Hummel soon entered the Convent of Siessen to become a Franciscan nun. She chose the convent after realizing that it was an environment that would allow her to carry on with her journey into the world of art. It was in the convent when she became Sister Maria Innocentia. As a nun, Sister Hummel continued to hone her artistic abilities and German publishers soon showed interest in her artwork, transforming them into postcards. 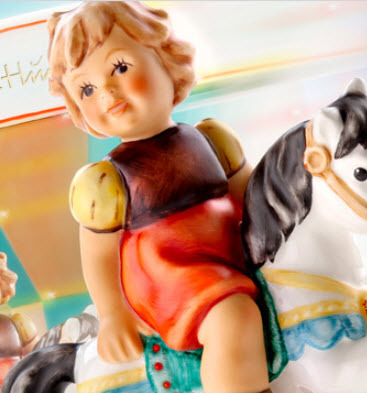 The postcards caught the attention of Franz Goebel of Goebel Master Sculptors and Painters who was looking for a fresh theme for a new line of figurines his company was planning to launch. Goebel met with Sister Hummel, informing his intention to create figurines out of her artwork. Upon the convent’s approval, the collaboration between Sister Hummel and Franz Goebel produced the first set of figurines based on the nun’s drawings in 1935. Sister Hummel died in 1946 at a very young age of 37 but Goebel preserved her artistic legacy through M.I. Hummel figurines. In 2009, Manufaktur RÃ¶dental became the new owner of the M.I. Hummel brand. Committed to ensure the artistic excellence the brand stands for, the company employs a team of highly skilled craftspeople that creates widely acclaimed priceless treasures and collectibles, a tribute most fitting to the talented Sister Hummel.